While most of the tech world is abuzz with news related to the HTC One (M8), that’s not the only One vying for your attention. Earlier today, OnePlus announced that the teasing is almost over and that the company will be fully showing off its OnePlus One handset on April 23rd. If that’s not enough to get you excited about the company’s Cyanogenmod-powered handset, OnePlus has also released a new image to its Facebook page that illustrates how it’s One is better than the new HTC One (M8). OnePlus points out it has a bigger display, a 13MP camera, a bigger battery and that it lacks an extra branding logo on the front. OnePlus also shows how both handsets offer a quad-core Snapdragon CPU and similar storage options, but the OnePlus One has a price tag that’s under $400. What else do we know about the OnePlus One? According to OnePlus, the handset will feature a hands-free voice control similar to the Moto X, has removable backs that will come in bamboo, denim and other premium materials, and manages to pack a 5.5-inch display into a body that’s no wider than the Xperia Z1. 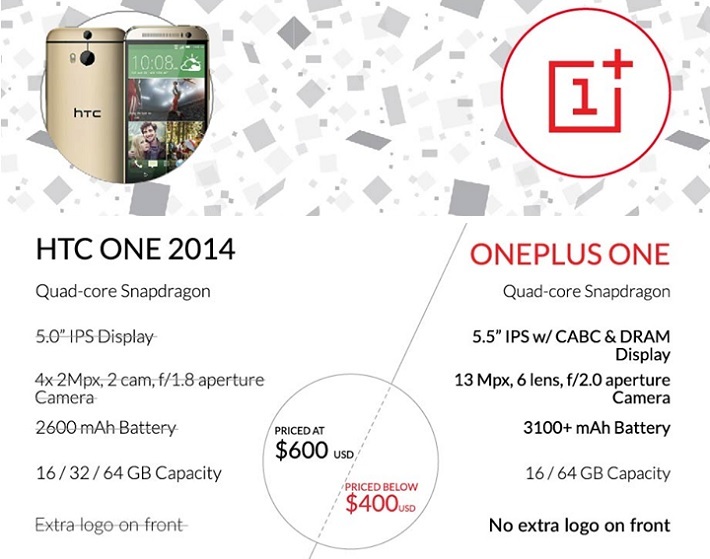 Whether you actually find the OnePlus One more appealing than the HTC One M8 probably comes down to a matter of preference, especially in terms of display size and the differences between cameras. What do you think of OnePlus’ One, are you intrigued by what you’ve heard and seen, or will you reserve judgment until the company full outs the device on the 23rd or April? Conversely, what do you think of the HTC One (M8), impressed or not?